Adding lockers to your warehouse is probably much more affordable than you even realize. These simple storage systems also have several benefits. If a cluttered desk is the sign of a cluttered mind, what does a cluttered warehouse signify? The state of your warehouse can tell your clients a lot about your business, sending some running for the hills…or at least to your competitors. Fortunately, there are several simple solutions to help organize your warehouse, from pallet racks to wire shelving to lockers and so much more. Odds are that your employers do not show up to work empty handed. They probably have bags, lunches, cell phones, and, depending on the weather, sunglasses, rain coats, rain boots, scarves, gloves, hats, and/or coats. So where do all of these items get stored during the work day? Are they simply thrown around the breakroom or worse, the warehouse? Or do you have a storage system in place to safely and securely house your employees’ possessions? Organization: Perhaps the most obvious benefit of locker installation in your warehouse is storage and organization. Your employees will have a designated area in which to store their belongings out of sight. 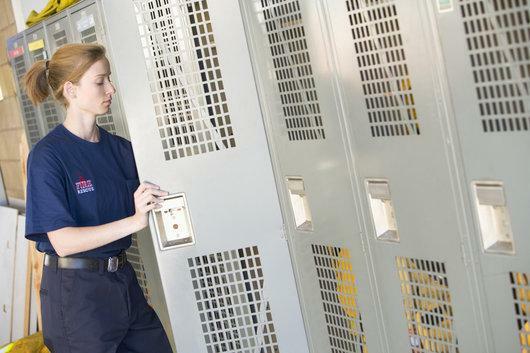 Security: Because lockers give your employees the ability to securely lock their possessions away, they can greatly improve security and minimize the threat of theft. Minimize Distractions: By giving your employees a place to store their cell phones, there is less of a chance for them to browse their phones during working hours. Your employees will be able focus and concentrate on the tasks at hand. Affordable: Adding lockers to your warehouse is probably much more affordable than you even realize. The S.W. Betz Company, Inc. has been providing businesses in Maryland and beyond with all of their essential Weighing, Material Handling, Dock, and Warehouse equipment since 1933. Over the years, we have developed many relationships with some of the top manufacturers in the industry, including Lyon and SpaceGuard Products. Lockers of all shapes, sizes, and materials are used in many different applications, ranging from industrial to commercial to residential. With our knowledge and background, we are able to help the customer determine the right locker for their needs and help them accomplish their storage goals. If you have any questions about Lockers and Locker Installation throughout Maryland, please contact S.W. Betz by calling 410-574-1414 or 800-332-0322 today! You can count on the S.W. Betz Company to work with you and provide you with our extensive knowledge of the industry. This entry was posted on Wednesday, October 7th, 2015 at 6:01 pm. Both comments and pings are currently closed.